I was asked what my favorite steak place was a few weeks ago at work. Honestly, I have to say its home. I feel blessed to be marrying a steak artist (EHK) soon. I think really nice cuts of meat can be found in markets nowadays and with a little practice you too can make a restaurant worthy steak. For this particular meal we purchased 2 generously portioned Prime rib eyes from Costco for about $27. Why Prime? Well its the highest grade assigned by the USDA. Below is the hierarchy of beef grades in descending quality. The Prime grade marks the finest quality. It has the highest degree of marbling and is the most tender, juiciest and flavorful. This grade can be found in the nicer restaurants and some meat markets (such as Costco). Its also priced significantly higher than its grade counterparts since its assigned to only a little under 3% of beef being sold. Choice graded beef is what you'll find most commonly as its graded for in about 50% of beef sold. Its got less marbling than Prime but its sufficient for taste and tenderness. Select is the lowest grade commonly sold and less flavorful, juicy and tender compared to Choice. Standard and Commercial have nearly no marbling and therefore even less flavor. If a package of meat is sold without a grade it is like one of these. Utility, Cutter and Canner are the lowest grades and least likely to be found in the market. They are generally used by processors or canners for soups, and other canned foods containing beef. My favorite cooking method is seared stove top in the cast iron oven. The Kirkland Signature 6.5 qt French oven is my favorite pot to cook in right now. Its the ultimate multipurpose tool for the kitchen. 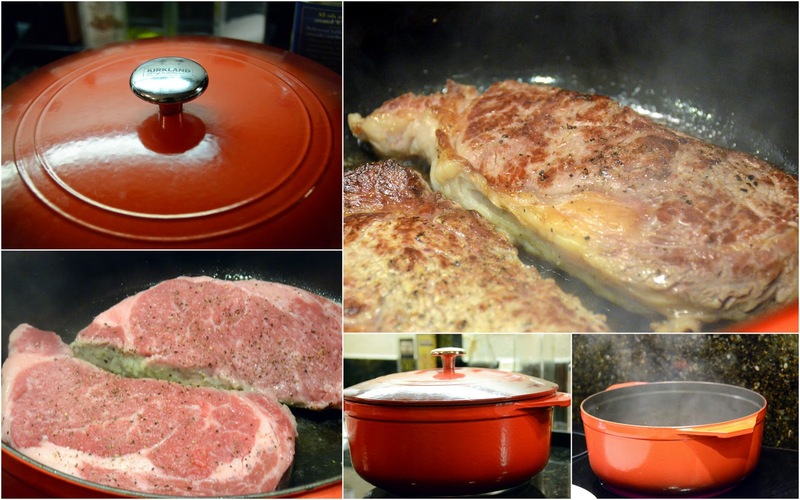 We've played around with the Staub 7 qt oval cocotte and though it sound cool to say you own a Staub... we really couldn't tell the difference in results compared to the Kirkland other than the extravagant price of over $200. I'll take my Kirkland's comparable performance, also produced in France, also nippled lid, sub-$100 and Costco satisfaction guarantee any day. So heat up the oven to high. 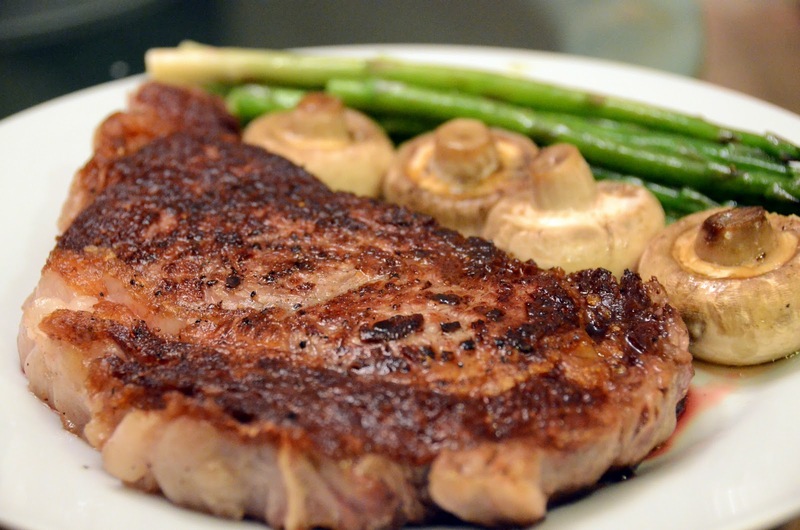 As the oven is heating up, rinse, dry and season the steaks with some oil, salt and pepper. When oven is piping hot, sear on one side for 2 mins, then cover for 3 mins and sear on other side for another 2 mins. This produces a lovely crusted medium rare steak given our oven and stove stop. Adjust your cooking time given your equipment and preferred meat doneness. Sides? We drizzled some button mushrooms and asparagus with extra virgin olive oil, sprinkled some salt and pepper and popped in the top rack of the oven to broil till desired doneness. Dinner is served! omgoodness this post is making my mouth water! thanks for the tips! i'll definitely try it very soon! I enjoy making steak dinners with my family as well! Having a full production line for steak dinners is a great time to bond with each other, and it makes the meal so much more special, in my opinion. We usually just stick with choice cuts, and prefer to leave our steaks in the marinade overnight to get the full flavors inside the meat. We also prefer our steaks well done, and topped with a slice of single cheese while it’s cooking.